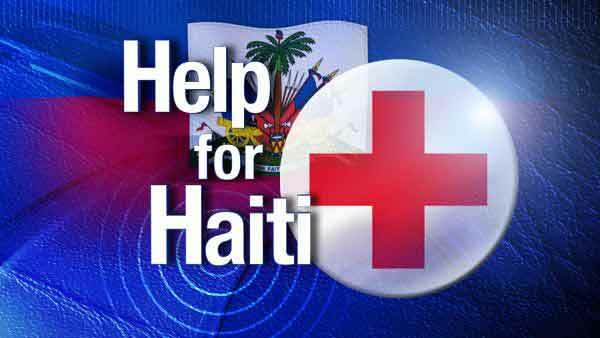 Help for Haiti: Watch live hourly updates starting at 9:00 a.m on Channel 7 and 7online.com on Friday. Click here. Text “HAITI” to “90999” to make a $10 donation. The amount will be added to your next phone bill. The organization is also accepting donations through its International Response Fund. WYCLEF JEAN’S HAITIAN YELETo donate $5 to Wyclef Jean’s Haitian Yele charity, text 501501. The money will be added to your next phone bill. To find out how to help the International Rescue Committee, visit www.theIRC.org or call toll free, 1-877-REFUGEE. The State Department has set up a toll-free number to call for information about family members in Haiti: 1-888-407-4747. www.state.govSecretary of State Clinton has set up an aid line that people can use to send money to support Haiti relief similar to what was set up to support refugees in Pakistan earlier this year. Cell phone users can text “haiti” to 90999 and $10 will go to relief efforts in Haiti. The $10 will show up on your phone bill. www.concern-worldwide.orgConcern Worlwide US calls on the public for urgent support to allow the agency to provide food, water, shelter and medicine as the immediate priority for those that have survived the catastrophe. Monetary contributions can be made by sending checks, payable to CMMB-Haiti, to CMMB, 10 West 17th Street, New York City, New York 10011, or by calling 1 800 678 5659. Pledges can also be made via the CMMB website, where an ad appears, cmmb.org, or by a direct web link: http://support.cmmb.org/Haiti. Donated medicines and medical supplies are also being accepted by CMMB. To make these donations, please contact Kathy Tebbett, at 1 212 242 7757. For information on how to support or donate to the relief effort, please visit www.nj4haiti.org or call Jefferson Park Ministries at 908-629-0041. Jefferson Park Ministries will also be holding grief counseling every night starting Thursday, January 14 from 6-10 p.m. at Madison Avenue in Elizabeth, New Jersey. OPERATION USAOperation USA is appealing for donations of funds from the public and corporate donations in bulk of health care materials, water purification supplies and food supplements, which it will ship to the region from its base in the Port of Los Angeles. To make a donation, by phone call 1-800-678-7255 or online at www.opusa.org. STILLERSTRONGBen Stiller’s Stillerstrong campaign will temporarily diverting all donations to support the Haiti relief effort. MERCY CORPSMercy Corps is sending a team of emergency responders to assess damage, and seek to fulfill immediate needs of quake survivors. DIRECT RELIEFDirect Relief is committing up to $1 million in aid for the response and is coordinating with its other in-country partners and colleague organizations. Their partners in Haiti include Partners in Health, St. Damien Children’s Hospital, and the Visitation Hospital, which are particularly active in emergency response. INTERNATIONAL MEDICAL CORPSTo make a donation, please visit www.imcworldwide.org.